Join us as we take you through the heart of Albuquerque, down luminaria-lined avenues in Old Town and past some of the most impressive light displays in the Southwest. Our unique and intimate bike tours are the perfect way to experience the holiday sights, sounds, scents, and magic of New Mexico without the traditional headaches of heavy traffic and slow moving lines. 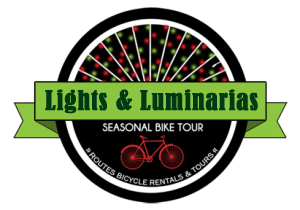 Now in our 8th Annual holiday season, Routes Bicycle Tours ‘Lights & Luminaria’ Bike Tour has become a festive tradition for friends and families all over New Mexico! Historic Old Town Albuquerque and the nearby Country Club neighborhood close their streets to automobile traffic on Christmas Eve, and together host one of the most extensive luminaria displays in the state. Old Town is also home to the City’s impressive holiday tree and the famous decorations and ceremonies of the San Felipe de Neri church. 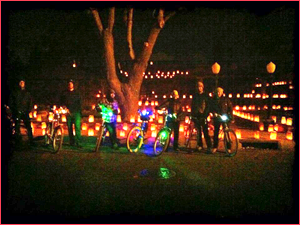 Your breathtaking Christmas Eve bike tour begins with a stunning ride through Old Town and around the San Felipe de Neri church to view the city’s largest concentration of Luminarias. We then proceed into the Country Club neighborhood, where every street is twinkling with holiday cheer and impressive light displays. This fantastic neighborhood also hosts an annual hot air balloon “glow” at sunset for your enjoyment. With this year’s VIP tickets, guests can fill up on even more holiday cheer throughout the evening, in the tasty form of spiced cider, hot cocoa, New Mexico Piñon Coffee (unlimited refills with your special, keepsake Routes mug), and locally-made biscochitos (a traditional NM cookie). 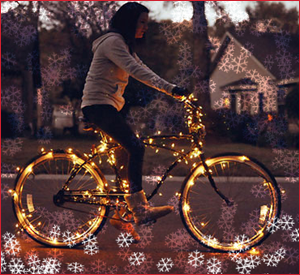 The entire tour is approximately one hour in length and will be experienced from the comfortable seat of our signature cruiser bicycles, which have been festively transformed into impressive light displays of their own! Multiple routes, times, and bicycle options are available for your enjoyment. You may choose to rent a bike from us or bring your own bike at a discount (BYOBike). All rentals come with a helmet, bicycle lights, our festively decorated “twinkle light” bicycles, and -as always- Routes’ coveted goodie bags for each rider! This year, compliment your heart-warming bike tour with a body-warming beverage and keepsake mug! General tickets include a cup of locally made cider, delectable Hot Chocolate, or New Mexico’s favorite pinon coffee. Want to enjoy your hot beverage throughout the events? Purchase a VIP Mug Club ticket and receive unlimited refills throughout the evening in our collectible Routes Bicycles mug! To reserve your seat on our tour, please select the date you wish to ride from the options below. ALL Holiday Tours must be reserved either online or by calling us at (505) 933-5667. Is your preferred time SOLD OUT already? Call the shop to be placed on the waiting list. If we have enough guests on the waiting list, we will open up an additional tour! TICKETS GO ON SALE NOVEMBER 1ST EACH YEAR! Times: SOLD OUT Please call (505) 933-5667 to be placed on the waiting list. All riders must be comfortable riding after nightfall and all riders must have front/rear lights (rentals available – all rental bikes come with lights). What the heck are Luminarias? 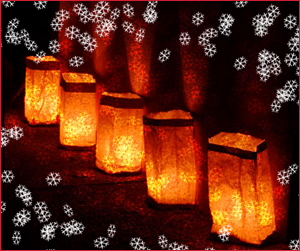 Luminarias (or farolitos) are a holiday tradition in New Mexico and consist of brown paper bags illuminated from within by a votive candle (electric versions are also available). Thousands of luminarias are arranged in rows and patterns along streets / in plazas / on rooftops throughout various neighborhoods in Albuquerque to create a beautiful display of flickering light. *PLEASE NOTE: Refunds are only available in unrideable weather conditions as determined by Routes Bicycle Tours & Rentals, Inc. Due to the high demand for these tickets, there will not be any refunds for anyone who misses the Bike Tour for any other reason. Thank you for your understanding.